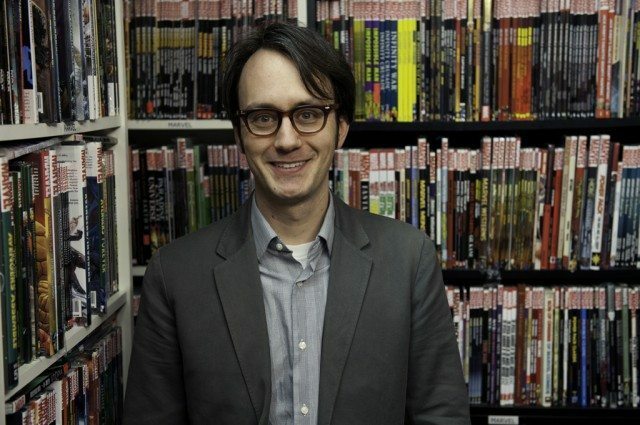 Peter Birkemoe’s daily grind is a comic geek’s dream: every day, he oversees the operations of Toronto’s finest comic shop, which occasionally sees him hobnobbing with some of the industry’s nimblest minds and, more often than not, keeps him surrounded by books. We asked the owner of The Beguiling what it takes. Torontoist: When did you get into comics? Peter Birkemoe: I guess I collected comics only modestly through my preteen years and caught the real bug probably around age 14 or 15. I was able to get a job at a shop in Kitchener called Now and Then Books, which was Canada’s oldest comics shop at the time but it closed very recently. So, I was a comic collector and started shopping at The Beguiling also, as a teen, shortly after it opened. I did not open the store but I bought it in 1998. What prompted you to purchase the store? I had worked at the store very occasionally, mostly just picking up a shift when someone needed a day off to feed my comic book habit. But when the store was going to be sold, I got it together to purchase the store mostly because I was afraid that what was then one of the very few places you could buy this type of comic was going to fall into hands where they would no longer continue carrying the interesting kinds of comics. So I wanted to have the kind of place where I would be able to buy my kind of comics. The Beguiling is celebrating its 25th anniversary in a couple of weeks, which is a tremendous feat for an indie bookstore, and you’ve been in charge of the place for more than half of that run. What’s your secret? One of the things that we have going for us, as do most of the indie bookstores that have survived, is that we have a highly knowledgeable staff that cares about what they do and can do that kind of hand-selling that can’t be replicated online. And we’re very lucky to have a loyal clientele. Having been around for 25 years, that’s something that’s grown along with us. This very store, transplanted into any other like-sized city, wouldn’t necessarily survive because, for the type of esoteric material and engaged comic culture we have here, you would’ve had to have a place to obtain those kinds of comics over the years in order to have that size of audience. How has the audience been built? It’s built very gradually. There have been times over the life of the store where the viability of the comics market, or particularly the market for interesting literary comics or small-press materials that The Beguiling has been associated with so much, has really been fragile or the future has been very uncertain—and we may even be in one of those times now—but we’ve persevered and built that audience year-by-year. What are some personal highlights for you from over the years? Over the course of running the store and particularly with the number of events we do I’ve managed to meet just about every cartoonist whose work I admired or collected as a young person or came to admire as an adult reader of comics. And one of the things we’ve accomplished is the starting of the Toronto Comic Arts Festival. Myself and one of our managers here started this festival and now I don’t have to travel to any international comic events, and I don’t want to, because the best that the world has to offer in terms of comics comes here. And that in itself is very rewarding, but it’s also great that every time it happens, people come from around the world for this festival and tell me what a great shop this is, which reinforces the pride we have in the work we do. Your job sounds kind of dreamy; you’re constantly surrounded by the newest and most exciting work in the comics biz and have hosted some of the industry’s most groundbreaking figures. That said, what are some of the less glamorous aspects of your job? Doing any sort of book retail involves a lot of lifting heavy boxes of books from one place to another. That’s an enormous amount of this job, just moving this product through space. Sometimes that has its high points, when you discover a box that has been lost for 10 years and you’re like, ‘Oh! Here’s a case of an out-of-print book we could really use!’ But most of it tends to lean towards drudgery. Your dad is a well-known engineering prof at the University of Toronto (and happens to also be named Peter Birkemoe). Was he weirded out when you decided to take over a comic shop instead of, say, following in his sciencey footsteps? I did, myself, do an engineering degree. So I followed at least the educational path. However, my father paid me one of the greatest compliments ever. It was not directly to me, but someone else told me he had said it, that his son is the only person he knew who every day is doing exactly what he wants. So I thought, well, that sounds like an endorsement. What’s your vision for the future of The Beguiling? I think bookselling is going to change a lot. I don’t see it disappearing within my lifetime, but I’ve played the last-man-standing game in many aspects of this before and I have a certain confidence that I can continue to make a living within comics as long as I choose to but that the form of that will have to change with time. Some of that is going to have to relate to the festival we produce; some of that may shift from being new product as perhaps publishers stop producing new comics as a physical form and shift to an antiquarian [function]. We also act as art dealers and if physical comics cease to be a new thing, people will probably still be producing artwork. And, we’ve even published a book, so there are all sorts of things we will continue to do to continue to have a physical retail engagement of the public. But we’re just slowly adjusting our course as we go. The Beguiling will be celebrating its 25th anniversary on November 12 with readings by Charles Burns, Adrian Tomine, and Chris Ware.